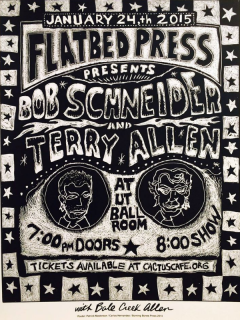 Flatbed Press and Gallery is celebrating its 25th anniversary with an intimate performance by Bob Schneider and Terry Allen with special guest Bale Creek Allen. Held at the University of Texas Ballroom, this collaborative call-and-response type of improvisational show will grant viewers an intimate look into the personalities of the these great musicians. An exhibit featuring the artwork of Schneider at Allen is currently on display at the Flatbed Gallery.